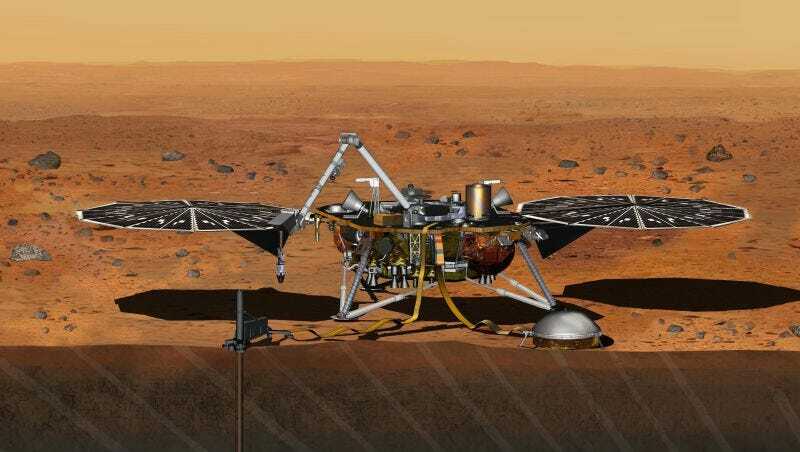 Late last year, the lander NASA was going to send up to Mars was grounded just three months before its planned launch date. Now, it looks like NASA’s Insight Lander will make it up there after all. The drill-lander, designed to burrow into the planet’s surface and tell us what lies below, was originally set to go up to Mars this month—until a series of leaks grounded it in its very final testing stages. When we asked NASA back in December whether everything would be set to go by the next launch window in May 2018, it wasn’t yet certain that the Insight lander would make that one (or, perhaps, any) window. The question wasn’t just technical (principle investigator Bruce Banerdt described the technical problem at the time as “a minor setback, not a disaster.”) There was also a lingering question over whether money for tacking an extra two (or more) years on to the mission would come through or not. Today, however, NASA was able to set a date for the first launch window for Insight, which will launch on May 5, 2018. That means that the rover will hit Martian soil by November 26, 2018.